With more and more time being spent on a seat, people are looking for high quality seat options. This is especially the case with office chairs. There is nothing as bad as getting an uncomfortable seat for your office. Not only will you suffer agonizing pains in all sorts of places from your neck to your lower back but your productivity will also be lowered significantly. Enter the LexMod Edge office chair with mesh back and black leatherette seat. This is a true masterpiece that you will enjoy for several reasons. It is almost impossible to trust some of the office chairs that make it into the market nowadays. Some of them are utterly weak. However, this chair from Lexington Modern is just perfect for heavy weights. Rest assured that the seat will support your weight for really long hours. This is because of its sturdy construction that allows it impressive functionality. Setting up the seat is also extremely easy. With no more than eight bolts needed to assemble this seat, you might end up thinking of it as weak. You will be amazing at how strong the chair is. Why would you want to buy a chair with a mesh back? Well, for starters they are very stylish and the LexMod Edge is a testimony to that. The mesh back gives the chair a very unique look as well as allowing free flow of air between your back and the chair. So if you have always had a problem with your back feeling too hot while you seat then you might consider this seat. On top of that, the mesh back on this LexMod chair brings with it amazing lumbar support. You would think that a chair without a cushioned back will have poor lumbar support. This is far from the case with this seat. It will ensure that you do not suffer the agonizing back pains that some office chairs do not protect you from. The height of this seat is just perfect for people of all heights. It really does not matter whether you are tall or short, with this chair you are guarantee a great deal of comfort. You can adjust the height of the seat very easily. It is not only the height of the seat that you can adjust; you can also alter the height of the arms. They can be flipped up and down. The leatherette cover on the impossible comfortable sponge seat makes it a truly modish piece. It is one of the most stylish comfortable office chair that you will find anywhere in the market today. Ease of assembly- this is the first thing you will notice when the chair is delivered to you. It needs only a few pieces fitted together and you will be good to go. Ergonomic lumbar support- if there is something that you do not have to worry about it is back pain. This seat allows for amazing support of your back while you work those long hours at your desk. Comfortable- it sponge seat is heavily padded to ensure that you do not have to keep fidgeting to find a comfortable spot on the seat. Adjustable seat height- with a lever located conveniently below the right arm rest, you can easily adjust the height of the seat to suit your specific taste. The flip-up arms allow you more comfort while your read; basically more comfort while using the seat. The leatherette seat cover makes it one of the most stylish seats in the market today. The main flaw that has not pleased some customers is the softness of the leatherette cover. The cover, they say, is a little bit too weak and it tears very easily. This necessitates for extra care with the seats to ensure that the seat does not get damaged. The LexMod Edge office chair with mesh back and black leatherette seat is nonetheless a high quality piece. 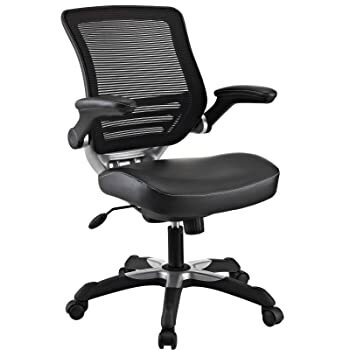 It offers more than most people bargain for when buying office chairs. It works perfectly for people of all heights and it will be a great addition to your office.